Please ensure that all children have a spare change of clothes in a bag on their peg. This should include socks, underwear, skirt/dress/pants and t-shirt. These should all be labeled with your child's name. As much of the school day is spent outside, it is essential that children attend school in appropriate clothes. 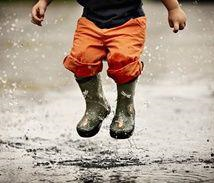 This includes suitable shoes which children are able to put on independently, a waterproof coat and wellington boots for especially wet days. As the weather grows colder, please ensure your children are dressed appropriately. You may wish to provide your child with a hat, scarf and gloves. We ask that please clearly label these with your child's name. Water bottles should be in school each day and can be filled at home or in class each morning during the stay and play. These should also be clearly labelled with your child's full name. Each morning we invite parents and carers to join us for 10 minutes to help settle your children and to engage with the activities in our environment. We signal the end of stay and play with a tambourine and ask that adults leave promptly so that we may begin our school day. During the morning stay and play session and at the end of the school day, Mrs Power and myself are available should you wish to discuss your child or the Nursery. We welcome any news or important information you would like to share that may benefit your child. If you would like to make an appointment to meet after school, you may contact the school office in order to do so. Please ensure that we are kept up to date with any medical or dietary requirements as well as any other information that will support us in caring for your child.